Last month, I made Logicly 1.3 available as a public beta. After some great feedback from the community, I fixed some bugs and added the final bit of polish. Today, you can download Logicly version 1.3.1, which includes all the great features mentioned in the beta announcement. In particular, a couple of new features are worth mentioning again. The first one is the ability to add points to wires and snap them into straight 90 degree angles. I first posted a preview of this feature on the Logicly Facebook page a couple months ago, and folks were pretty excited about it. I know a lot of you have been asking for this one for a while, and I’m glad I finally took the time to figure out how to do it. The other big one is the ability to create a reusable integrated circuit, or to package up a part of your document into a black box, similar to the flip-flops. Everyone has wanted this one for years, including me, and I’m so happy to finally share the first iteration. 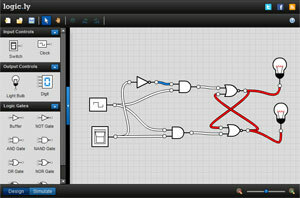 Expect the integrated circuits feature to be improved in upcoming versions of Logicly. What’s available in 1.3 is a great start, but I intend to add much more in the future. Thank you very much to the helpful beta testers who reported bugs and provided awesome feedback. I hope that you’ll continue to test future betas as they become available. To everyone else waiting for the final release, please point your browser to the Logicly download page or go to the Help menu and choose Check for Updates. If you’ve been playing with the demo, and you like what you see, maybe now is the perfect time to buy Logicly. Edit: A big thanks to all the beta testers who sent in bug reports. The beta period is now over, so please Download Logicly 1.3.1 today. Starting with version 1.3.0 of Logicly, each update will be made available for a short time as a public beta. Please consider downloading it early and providing feedback. In particular, please file bug reports for anything I might have missed during testing. As far as I know, everything is stable, but I’d rather limit any issues to a few brave beta testers before I push something out to everyone. Thank you, everyone. What’s new in 1.3? As always, your feature requests steer the direction of Logicly’s development. Rotate multiple selected objects. You’re no longer limited to just one for rotation. A whole group will rotate around its center. Add points to connections. 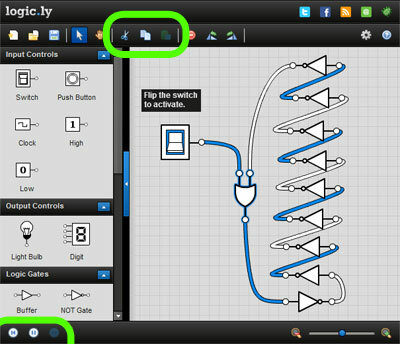 Right click on a wire and choose Add Point, or simply click the middle of a wire and drag. You can drag the point anywhere you want, and it will snap to other points on the wire. This can be used to create straight wires and 90-degree turns. In the future, I may add the ability to snap to points anywhere in the document. If you think that’s important, or even if the feature is good enough as-is, please let me know. Deleting connections has changed. Before, you simply needed to click on a wire with your mouse, but wires are now selectable. You can use the Delete button on the toolbar, choose it from the context menu, or simply press the Delete key on your keyboard. Document-specific settings. There’s only one for now, but it’s one that was sorely needed. Previously, we had Default Float Signal global setting that allowed you to set the default value for an unconnected input. It is Unknown by default, since a real circuit may be unpredictable, but I know a lot of people like setting it to High/True instead. If people with different global settings share documents, this can lead to unexpected behavior. Now, this setting applies to each document individually so that all documents behave as the original author intended. The global setting still exists as a convenient default for new documents. Changing the global setting does not affect the currently open document. 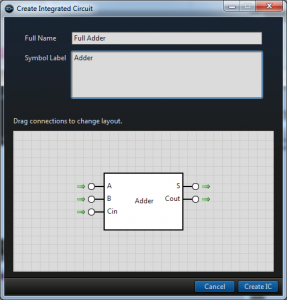 Create Integrated Circuits from a selection. Have you always wanted to make a reusable component? Now you can. To define inputs and outputs, Toggle Switches and Light Bulbs now support an Export Name property. When you select a group of objects and choose Create Integrated Circuit on the context menu, Edit menu, or from the toolbar, you’ll get a new window to name your circuit and to define where the inputs and outputs are located. You can drag and drop inputs and outputs to the left, right, top, or bottom of the symbol in any order. Once created, your new custom circuit will appear in the “Custom” category at the bottom of the list of components in the main window. I’ve worked on adding pieces of this feature for years. The flip-flops initially added the ability to simulate a complex circuit behind a single skin. 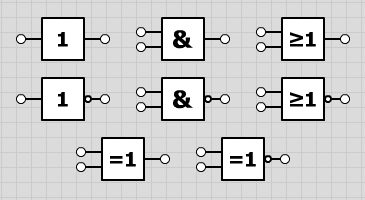 The ability to change the number of inputs on some of the logic gates was meant to eventually become a part of custom circuits. Combine that feature with the ability to change between IEC and ANSI skins for logic gates, and I finally put together a flexible skinning system that could work with a variety of components. After those three major parts were in place, it became a lot easier to see how they needed to be combined, and now you can play with the first iteration in 1.3. Currently, this feature still has some limitations. For instance, once you create a circuit, you cannot view its contents. It becomes a black box. This is only temporary, and I plan to add drill-down into circuits in a future version. You can’t export a single custom circuit to a file and then import it into a different document. 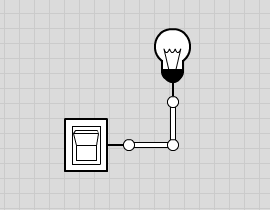 This will be important for sharing custom circuits, but it’s not quite ready yet. However, you can copy and paste custom circuits between documents, so sharing isn’t impossible. Maybe just a little cumbersome. Again, this is something I already intend to address later. 1.3 also includes minor bug fixes and polish, as always. Finally, please note that the documentation has not been updated yet. Check out the beta documentation for more details about the new features. If you have any questions, or if you aren’t sure how something works, please don’t hesitate to ask. Ready to try out all this cool new stuff? Download Logicly 1.3 Beta now. If you find any issues, or if you have some feedback about the new features, please don’t hesitate to drop a note or file bug reports. If there aren’t any major bugs, this version of 1.3 will be pushed live as a full update soon. With a new school year running at cruising speed, Logicly has been helping students around the world more than ever. Thank you all for your support. I’m so happy that you’re enjoying working with Logicly. A new version with some of the most requested new features is in development right now, and I plan to release it before the end of the year. In the meantime, though, a couple important issues needed to be fixed immediately. All Logicly users should download Logicly 1.2.1 as soon as possible. This is a critical update for Mac OS X users that fixes an application crash on startup if Adobe AIR 3.0 is installed. Bug fix: An issue with the color pickers in the settings dialog could lead to the application entering an unrecoverable state. Affects all operating systems. Finally, the mechanism for update checking has changed. Future versions of Logicly may not be relying on the separate Adobe AIR runtime, so everyone should update to Logicly 1.2.1 to ensure that you are properly notified of new versions. I hope students and instructors alike have a wonderful quarter or semester ahead. If you have questions, bug reports, feature requests, or anything else on your mind, please don’t hesitate to send over a note. If you love Logicly, and you’d like to support development, please consider purchasing Logicly for yourself or your students. Improved the editing surface rendering performance. That means more gates, so make those projects bigger! If a file is very large and takes a second or more to open, a progress bar will be displayed. You can now drag a .logicly file into the main window, and it will replace the current document. Fixed an issue where an AND gate (and anything else using the and logic function) would sometimes fail to provide a correct false value if the number of input gates was greater than two and the and of the first two inputs evaluated to undefined. Fixed the centering of pasted objects when the editing surface is zoomed and panned. Your installation of Logicly should ask to update automatically from time to time, and you will receive 1.2 in the next cycle. If you don’t want to wait, just open to the Help menu and select Check for Updates… to manually download and install the new version. If you don’t already have a Logicly license, please offer your support and purchase Logicly, staring at $29 for one user. If you’re an instructor or teacher, be sure to consider a Volume Pack for your computer lab. Volume Packs support multiple users at a discounted price. In the 1.1 release of Logicly, you’ll find two useful new features that many have requested. First, logic gates symbols from the IEC standard are now available. I know many prefer this style over the ANSI/IEEE “distinctive” symbols that Logicly offers by default. Just open up the Settings window, and you can find “Symbol Style” in the Appearance section. 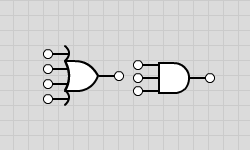 I’ve also added the ability to create logic gates with more than two inputs. If you’ve been following Logicly on Facebook and Twitter, you probably already knew this feature has been in development because I asked for some advice about how many inputs everyone might expect to need. Based on your answers, I decided on a maximum of eight inputs, but I’m certainly willing to adjust that amount if you can suggest good uses for more than eight. Your installation of Logicly should ask to update automatically from time to time, and you will receive 1.1 in the next cycle. If you don’t want to wait, just open to the Help menu and select Check for Updates… to manually download and install the new version. If you think Logicly is a useful tool, and you enjoy seeing new features like these, please offer your support and purchase Logicly for $29. Thank you. 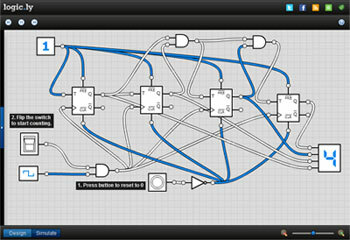 Your favorite logic circuit simulator is now available for download. This release marks a big milestone. Until today, Logicly has simply been a fun little simulator that runs in your browser. Finally, you can buy Logicly and get the ability to save your designs and work offline. Logicly is supported on Windows and Mac. Download the free 30-day trial, or try out the Logicly online demo without downloading anything. When you’re ready, buy Logicly to receive a product key by email to unlock the trial. Thank you all for your patience while I put the finishing touches on Logicly. I’ve been working hard over the last five months to be sure everything is working solidly. If it weren’t for so many wonderful users like you folks, I would never have made Logicly more than the subject of a quick blog post two years ago. Ready to take your Logicly creations to the next level? Go buy Logicly right now! As always, if you make something cool with Logicly, please post pictures on Facebook for everyone to see! We’re getting very close to the 1.0 desktop release of Logicly. The majority of the work I’ve been doing has been on the desktop app, but there have been a few overall changes here and there, so I thought I’d push out a new build. There is no longer a separate Simulate perspective. Design and simulation are now combined, with simulation controls on the bottom left where the perspective toggle buttons appeared previously. Cut, copy, and paste have been added. They’re on the toolbar and they work with the standard keyboard shortcuts. There’s new setting called “Limit Propagation to Frame Rate”. If you turn this off, the signal will propagate much faster through your circuit. If you have a very complex circuit, turning this off may be desirable to increase simulation speed. However, there’s a tradeoff. A particular wire may change state multiple times during the extended propagation period, and you won’t be able to see intermediate states. For example, in the case of the Ring Oscillator sample, the intended visual effect will be ruined if the frame rate limiting is turned off. Wires now glow on mouse over and move to the top. This can be very helpful for following where each wire goes when many are overlapping. You can now quickly switch between the selection and pan tools by holding the Ctrl (or Command on Mac) key before dragging. Also, the pan tool now uses a hand mouse cursor. Flash Player 10.0 is the new minimum version. The previous build required 10.1, but I only needed to make a couple minor tweaks to support the older version. I figure it’s better if fewer people need to upgrade before trying Logicly. Enjoy! As always, please report a bug if you find one. Be sure to follow @logicly on Twitter and like Logicly on Facebook to stay up to date and see cool stuff as I’m adding it. SR, D, JK, and T flip-flops. The SR flip-flop is a master-slave implementation with negative edge-triggering. The others are based on IC 7474 and have positive-edge triggering along with preset and clear asynchronous inputs. Push Button. Generates a high signal (true) when you press the mouse down. Goes back to low signal (false) when you release. Constant Low and High input signals. Label. Display some helpful descriptive text in your creations. Supports multiple lines. Change the size of the editing surface grid (in pixels). 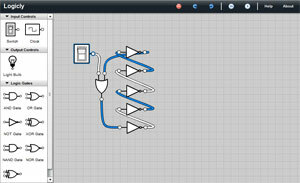 Toggle auto-start of simulation when switching to Simulate perspective. Now you can start with the simulation in a paused state. Change the appearance of connection wires between curves and lines. Change each of the signal colors (high, low, and unknown). Change the default “float” signal (it’s how unconnected inputs are interpreted). The default is still Unknown, like before, but now you can choose High or Low as well, if you prefer. Change update frequency of Clock control. Set startup signal of Clock and Toggle Switch. Change the text of the Label control. Design perspective is no longer “powered”. Any level of simulation, even without Clocks, must be done in the Simulate perspective. Advancing the simulation by a step now controls both Clocks and propagation. Previously, propagation still happened automatically when the simulation was paused, and it could theoretically get out of sync with the clocks. A new sample demonstrates how to create a ripple counter with T flip-flops. It also includes the High constant, a Push Button, and a couple of Labels. A variety of small bug fixes got in there too. This is a very solid release with more stability and a ton of new features that I know you all will love. We’re getting closer and closer to the release of the desktop app, and I’m pretty excited. That goes straight to my inbox, and I take all feedback very seriously. Please share your most-desired features. You can also leave a comment here on the blog too, or post something on the Logicly Facebook page (don’t forget to Like it). You can even send a tweet to @logicly. Keep the great ideas coming! Today, I’m proud to announce that I’ve uploaded the first preview build of Logicly, my digital logic simulator. I originally posted what I now call “the prototype” on my blog in late 2008. At the time, it was just a fun little experiment that I put together as a bit of nostalgia. One of my professors in college used a very simple Java applet to demonstrate logic gates in his computer architecture class, but he wanted something better. At the time, the project seemed daunting. However, with several years of real-world experience under my belt, it had become a fun weekend project. Over the last couple of years, Logicly has received much interest from computer enthusiasts, students, and educators. Both Reddit and Hacker News linked to it and provided excellent feedback. Even now, my blog’s traffic and top search terms are still dominated by people looking for Logicly. I get a few emails every month with praise, feature requests, and even stories about how a some students are using Logicly with their thesis work. Thanks to all this continued interest in Logicly, I feel that it’s time to add it bit more polish and release a desktop app that includes all the features that people consistently ask me to add. I have a bit more work ahead of me, but what’s there now already surpasses the prototype in a few areas. Things like multiple selection, a pan tool, and a couple new controls (a 4-bit digit, for instance) are the most obvious. I also spent a lot of time improving the simulation code, which leads to more consistency in propagation and timing. There’s a lot more planned too. Saving and loading files. This is, by far, the most requested feature. It will only be available in the desktop app. Flip-flops. These are also a very popular request. I wanted to get them working in this preview build, but there are a couple more things to tweak, and it’s not worth delaying the preview just for these. Grid settings, such as size and snapping. If you’re interested in future releases of Logicly, please subscribe to this blog, follow @logicly on Twitter, or like Logicly on Facebook. You can also sign up for the Logicly newsletter to get the announcement via email, if you prefer.